You'd need to attach the collision event directly to the shield actor. Ask a Question / Re: How to prevent the actor from sliding? Ask a Question / Re: Get Size of Line Drawn? Does that work with labels? That code is also interesting. Ask a Question / Re: Is this possible? Is it possible to maintain the size and position of the text when zooming in Stencyl? Yes. 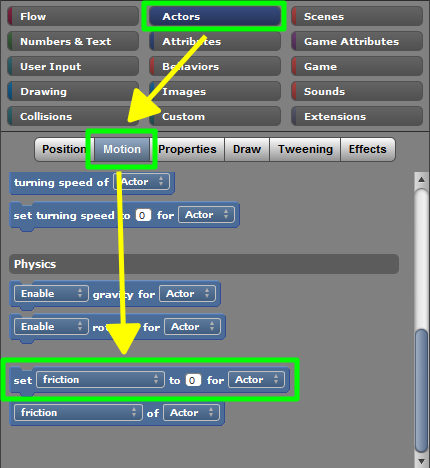 Use the drawing blocks in the events tab of an actor that is anchored to the screen. Ask a Question / Re: How do you create an outer glow effect in Stencyl? I use only the OpenFL filters and don't know a solution for HTML5 and Windows. Ask a Question / Re: How do I add more Friction? Is there a way to edit the code and make Friction from 1 to 100? Ask a Question / Re: Collison Boxes not properly deleting? Maybe your animation is not switching. Check it. Ask a Question / Re: Walking across uneven tiles.